The big news in Portugal today is that Benfica president Luís Felipe Vieir tried to sign Marco Silva from Watford and send Rui Vitória to Everton last year. The reason why these moves are being revealed now is because a tape with a conversation between the president and agent César Boaventura has been leaked on Monday. In the chat, Vieira and Boaventura talk about the plan. The agent claims that Everton tried to take Marco Silva from Watford for €9m, but the Hornets rejected the offer. Meanwhile, Vieira claimed that Vitória had a €15m release clause at Benfica, but to offload him to Everton, he would make a discount and let him go for €10m. Then the path would be free to get Silva. This story happened by the end of 2017, when Everton were indeed being linked to both managers. 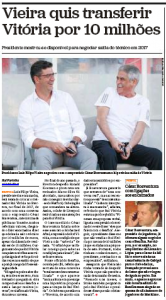 After the conversation was leaked by Correio da Manhã, Boaventura made many complaints on Facebook, saying he contacted the outlet, but they didn’t want to hear him. What he wanted to say is that it was Everton who went after Vitória, with talks being handled by Bill Kenwright. Boaventura adds that Vieira had ‘rejected two offers’ for the manager, and ‘wouldn’t sell for less than €10m’. That sounds a little different from the tone of the 2017 conversation, where they seemed like wanting to let Vitória go as soon as possible.